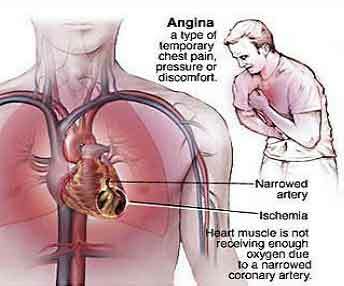 Angina is the first symptom that indicates the onset of heart problem. A chest pain or pressure on the chest caused due to blockages in the arteries leads to anginal symptoms and may culminate into a heart attack. Therefore, if you want to keep your heart healthy and want to stay fit and happy all through your life, you need to make certain changes in your lifestyle. It will help to prevent angina and also keep the other diseases at bay. A healthy lifestyle is the only way of reducing your chances of getting a heart attack. In case you already have angina then, it becomes vital that you make immediate changes in your lifestyle to prevent angina related symptoms and reduce stroke or heart attack risk. A balanced diet, regular exercise, avoiding smoking are the most effective ways of lowering blood pressure, keeping your blood cholesterol levels under check and strengthening your heart. Eating a healthy diet includes eating foods that are high in fiber such as whole grain rice, fresh vegetables and fruits, nuts, lean proteins, legumes, and lentils.You should cut down on a diet that is high in saturated fat. On the other hand, you should include foods that provide unsaturated fat and increase good cholesterol level, albeit in a small amount. These foods prevent blockages of arteries and prevent angina symptoms. High intake of sodium or salt also increases angina risk. Hence, you must avoid eating salty foods such as chips, pickles, white bread, chutneys, papads and avoid table salt. An adult should eat less than 0.2 oz salt a day, which is almost a teaspoon. Smoking increases the risk of strokes and heart attacks as it narrows the arteries and increases blood pressure. If you are used to drinking alcohol above the recommended limits then, it is high time that you reduce your alcohol drinking. Alcohol contains high calories that lead to weight gain causing a further increase in the level of blood pressure. Excess weight forces your heart to work harder which can raise your blood pressure. Just dropping a few pounds can make a lot of difference. So, find out the diet you can stick to in a discussion with your dietician and make sure that you maintain a healthy weight. An Asian ideally should have a body mass index of 23 or less. Body mass index is calculated as weight in kilograms divided by the square of height in meters. Regular exercise helps you to stay active and keep your blood vessels and heart in good condition. It will help you lose weight, keep your blood pressure under control and reduce the risk of heart attack. You can take up low-impact activities such as swimming, cycling, walking initially. A Brisk walk at a target speed of 7 km/ Hr for 45 minutes every day should be the goal if you do not have to lose weight.If you already have heart disease/ high blood pressure consult your cardiologist before starting an exercise regimen. It is important to keep yourself happy and avoid stress. You must regulate your working hours. You must do some relaxation activity daily which may be Yoga, Pranayam, Meditation or breathing exercises. You must spend time with your family and friends. If you are already suffering from diabetes or high blood pressure, you must control them well in consultation with your physician. It is very important in the prevention of coronary or angina heart disease. Coronary heart disease occurs when blood vessels that provide blood & oxygen for heart muscle become hard and narrow. This is often known as "hardening of the arteries".